We just ended a week long vacation in Newport, RI. I have discovered a few extras to pack that make our hotel stay more pleasant. None of the items are “must haves”, but they do make your vacation a little more comfortable. Chances are we’ll go through a lot of tissues in a week. 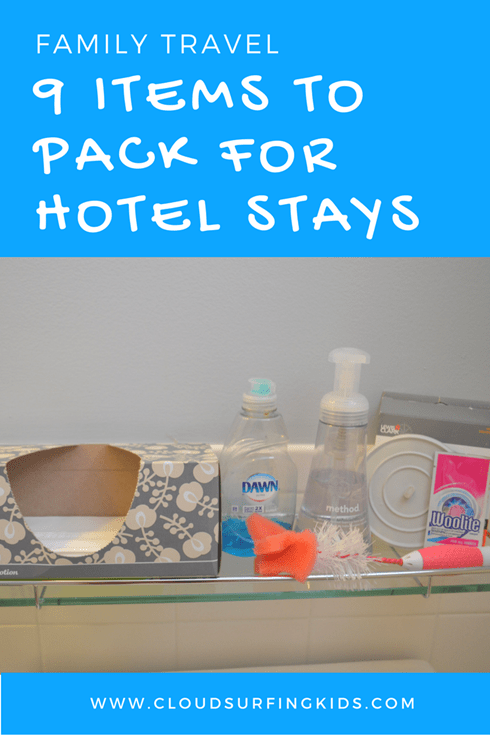 Whether due to allergies or colds, we always seem to use two boxes of tissues during a week long vacation. This past week my son John and I both acquired a cold. I was so glad I had the foresight to bring a large box of Puffs Plus with Lotion! The soft-as-sandpaper tissues the hotel provided would have rubbed our noses raw! Since we drove on this trip I just packed an entire family size box of Puffs Plus. When flying I remove the tissues from the box to save space. *Disclosure: For your shopping convenience I have linked to items I use. These links are affiliate links and when you make a purchase using them I may receive a small commission which goes directly toward the operation of this website. Thank you for your support! If you bring reusable water bottles like we do, you will want to bring a bottle brush. On this trip I used the bottle brush and dish soap to wash our Camelbak water bottles and medicine dispensers. On previous trips I also used reusable straw cups and washed them out (or bottles when the kids were younger). You can get away with just rinsing these things in hot water, but I’ve found they tend to get slimy and I’m sure the bacteria is growing without proper washing. I really hate washing my hands with bar soap. It gets slimy, slips into the sink, makes a mess…add in the fact that my daughter, Ella, is a sensory seeker and loves to dig into the bar soap with her fingernails…using bar soap for more then a two-day stay is no good for me. When we stay in a place for more than a few days I either bring or buy a hand soap pump. An added bonus is that the soap is usually less drying than the bar soap provided by hotels. You could stop by a Laundromat if needed, but I don’t like wasting vacation time doing laundry. I always bring a few packets of Woolite. There are other brands of laundry soap available in sink packets, but I prefer Woolite as it is easy to rinse out. You’ll see in this post how useful having these on hand proved on our Disney Vacation a few years ago. About 30% of the time we’ve stayed in hotels as a family we have had trouble with the bathtub drain plug. Traveling with this small sink stopper is easy and it comes in handy for bathing the kids as well as for doing laundry in the sink. I love this one with both a flat side and a plug side, designed to fit any sink or tub. Toss a few black garbage bags in your luggage and you can use them to black out the windows if needed. Pack a few strips of painters tape to secure these to the windows if needed. If your child is still in diapers, you definitely don’t want to be sharing a hotel room with the dirty diapers. Bring a Diaper Genie refill pack. Tie off the bags individually and cut with scissors to dispose of one by one. Like the scissors, if you’re flying you will want to remember to pack this only in your checked luggage. This past week I found myself wanting a paring knife almost every day as I tried to slice tomatoes, green peppers, apples, and peaches with a butter knife. A small paring knife is very useful if you are trying to supplement restaurant food with fresh fruits and vegetables. What do you think of this list of extras to pack? What do you pack that might not be essential but make your vacations more pleasant?